Since we are on the Mount of Olives today I thought I would address a common concern. One of our past pilgrims wrote to me expressing an apparent contradiction in the Bible about what I had said in Israel. The wording in the two verses below is what caused the confusion. So, did Jesus ascend into heaven from the Mount of Olives or from Bethany? 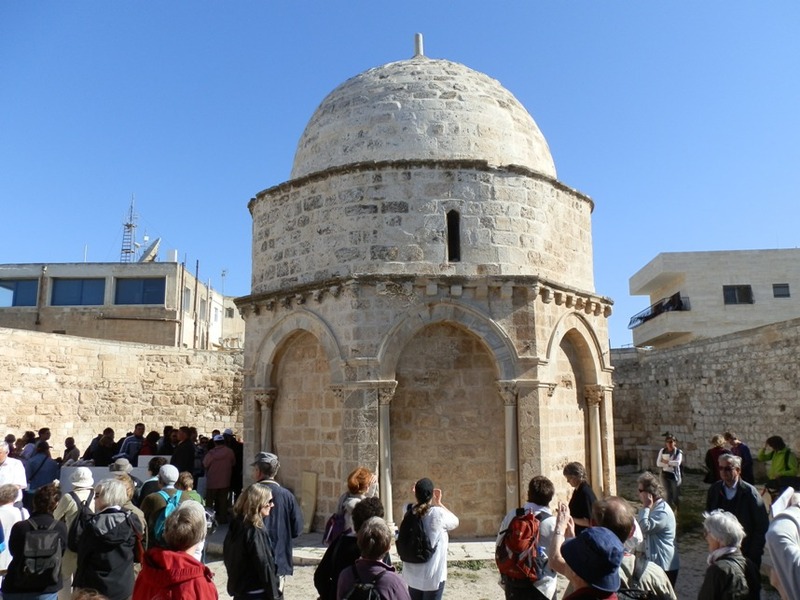 On pilgrimages, I take my groups to the top of the Mount of Olives to the Church of Pater Noster (the “Our Father”) where Jesus taught his disciples to pray in “the Grotto of the Teaching” — a cave beneath the front of the church. It is here that the oldest traditions inform us that Jesus was raised into heaven. Here Constantine built a church in the early 300’s. 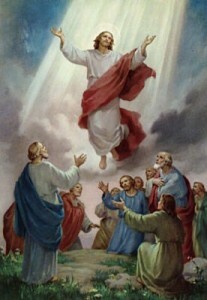 Here we celebrate Jesus’ departure and pray the Rosary’s 2nd Glorious Mystery of the Ascension. 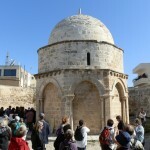 There is a Muslim mosque five minute’s walk away (called the Chapel of the Ascension) that most Protestants visit but I don’t patronize Muslim sites and don’t accept this as the authentic place of the Ascension. No one knows the exact square inches where his feet left the ground. But the Church of Pater Noster has the oldest tradition, is on the Mount of Olives and very near Bethany. 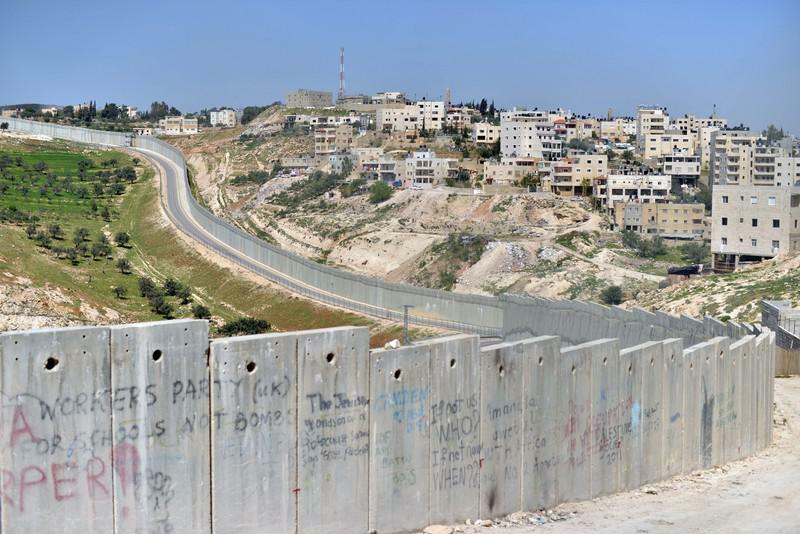 If we had had the time, and there was not the big wall separating Jerusalem from Bethany like it does Jerusalem from Bethlehem, in a few minutes we could walked into Bethany from the the top of the Mount of Olives. We used to walk people there to go into the tomb of Lazarus. That is how close Bethany is to the top of the Mount of Olives. However, I can’t do that with groups anymore because there’s a big wall that keeps us from walking from the Mount of Olives into Bethany. 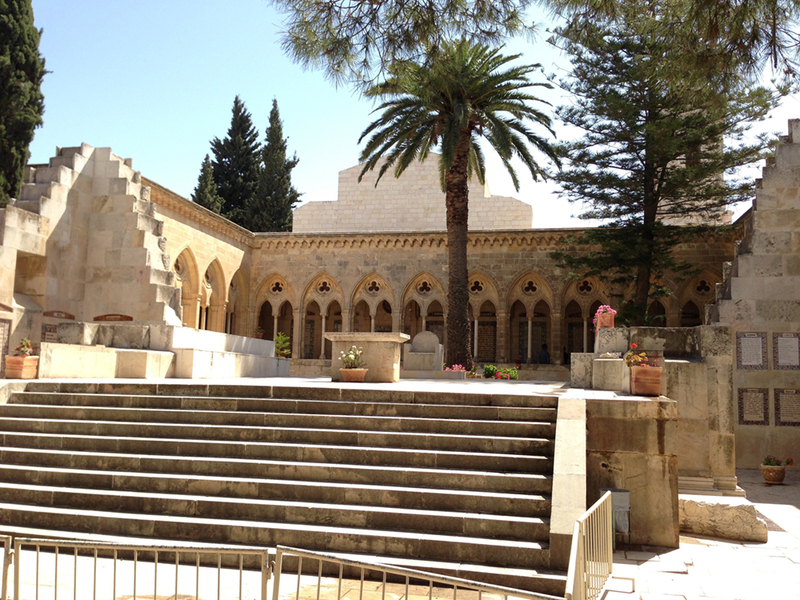 Bethany is on the eastern slope of the Mount of Olives about 2 miles from Jerusalem across the Kidron Valley. At the time of Jesus there was nothing on the Mount of Olives but olive trees (even until the late 1800’s, see picture black and white picture from about 1900). If you left from Jerusalem, heading to the Mount of Olives, it was perceived you were headed to Bethany. 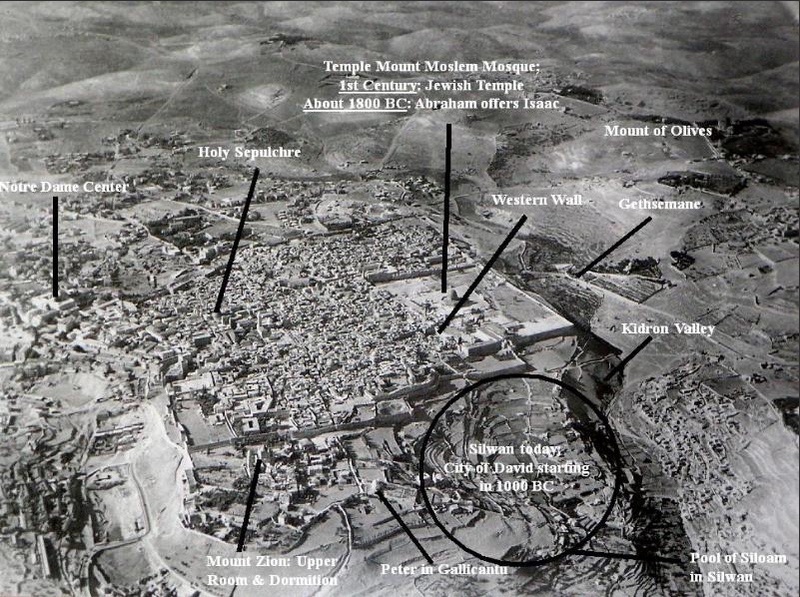 The picture shows that even until the turn of the 20th century there was nothing outside the old walls of Jerusalem. 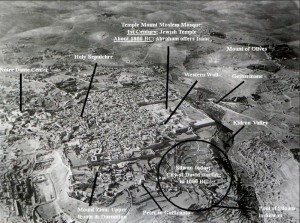 That meant there was just trees and open space between Jerusalem and Bethany. 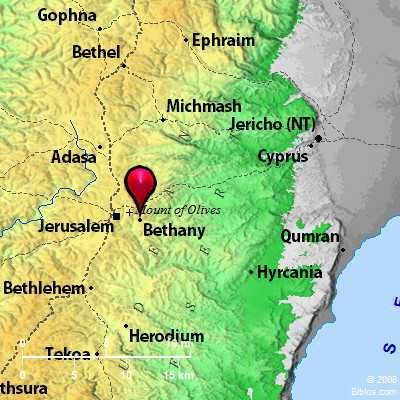 Bethany, though not seen on this map, was on the Eastern slope of the mount. 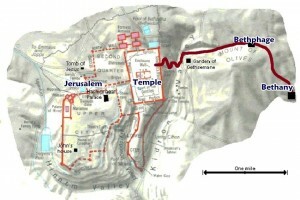 The other two maps show the proximity of Bethany, the the top of the Mount of Olives and the short distance from the walled city of Jerusalem. Luke wrote both the Gospel of Luke and the Acts of the Apostles. He obviously saw no contradiction in referring to both places as the general location of Christ’s ascension. It is easily explained this way. First, some suggest that he went as far as Bethany to say good-bye to the family he loved – Lazarus, Mary and Martha, then came back to the top of the mount and departed to heaven. However, there is no need to stretch things that far. Being on the eastern slope of the mount, Bethany is virtually on the Mount of Olives, especially from the perspective of Jerusalem. If there is nothing but trees and bare land on the Mount of Olives and you’re heading east from Jerusalem, people would say you are going to Bethany. Jesus left Jerusalem and went over toward Bethany to ascend into heaven. So if the geography is understood there is no conflict. Scripture can be trusted. Excellent! Great explanation. Your blog is like learning some new apologetic fact every day. STEVE RAY HERE: Thanks Tom. You are a good friend. I’m curious what you think about Matthew 28:16 – “Now the eleven disciples went to Galilee, to the mountain to which Jesus had directed them.” This seems to indicate that the Ascension occurred in Galilee instead of Judea. Is there an explanation for the apparent discrepancy? STEVE RAY HERE: Tom: We know that Jesus appeared to his apostles many times over the 40 days between his resurrection and his ascension. Some of these appearances were in the Jerusalem area and many in Galilee. While in Galilee he met them at least twice: 1) Mount Tabor where he gave them the Great Commission and 2) at the sea where he fed them loaves and fish in John 21. He also met them in the south. Mary Magdalen at the tomb, two disciples on the road to Emmaus, Upper Room and a few others where the location is not specified (http://www.catholic.org/clife/lent/appearances.php). The mountain in Galilee is Mount Tabor, the mountain of the transfiguration. The mountain from which Jesus ascended to heaven is the Mount of Olives. It is to the Mount of Olives that the Messiah will return at the end of time. After Jesus departed to heaven, the disciples walked back to Jerusalem and entered the Upper Room. Enjoyed the entry on the transfiguration. I have written a novel of historical Christian fiction . I am fact checking a final time, hopefully & would you know if Mary the mother of Jesus was with the disciples when He ascended. I wrote that it was only the Apostles who met the Blessed Mother afterward. I will look into the scripture in the meantime & check out your blog as well. I got this in a Google search. Thank you! Steve who was it that built that big wall and what's it for? 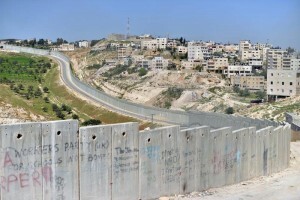 STEVE RAY HERE: The Wall was built by Israel to protect itself. It is intended to keep about Muslims with I’ll-intent, such as suicide bombers, from entering Israel and Jerusalem. It has been very successful in that regard. Previous post: All Day Bethlehem!